The Berlin Mietspiegel 2017 came out on may 19, 2017. 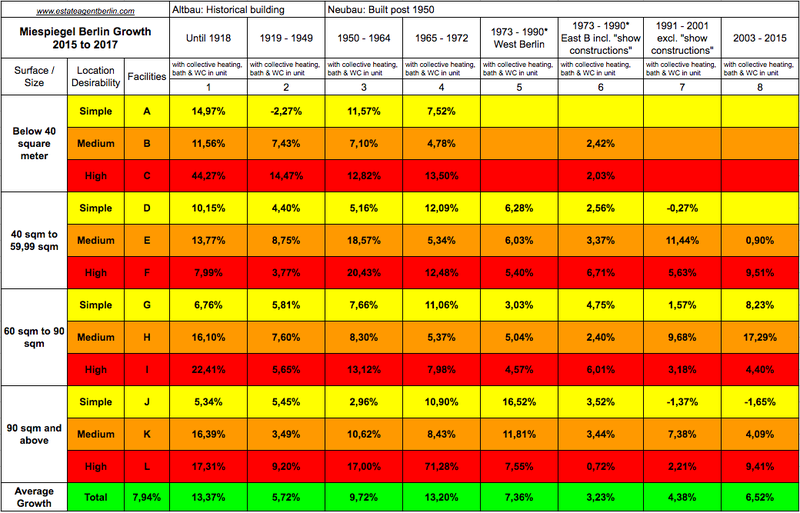 Every 2 years this document reports on the average prices of rents in Berlin. Mietspiegel in german literally translated means “rent-reflector”. At his name indicates it measures the recorded rent prices in the previous period (2015-2017). Berlin real estate investors, and property managers are very familiar with this document. Facilities in the units such as water cabinet, bathroom, and heating. 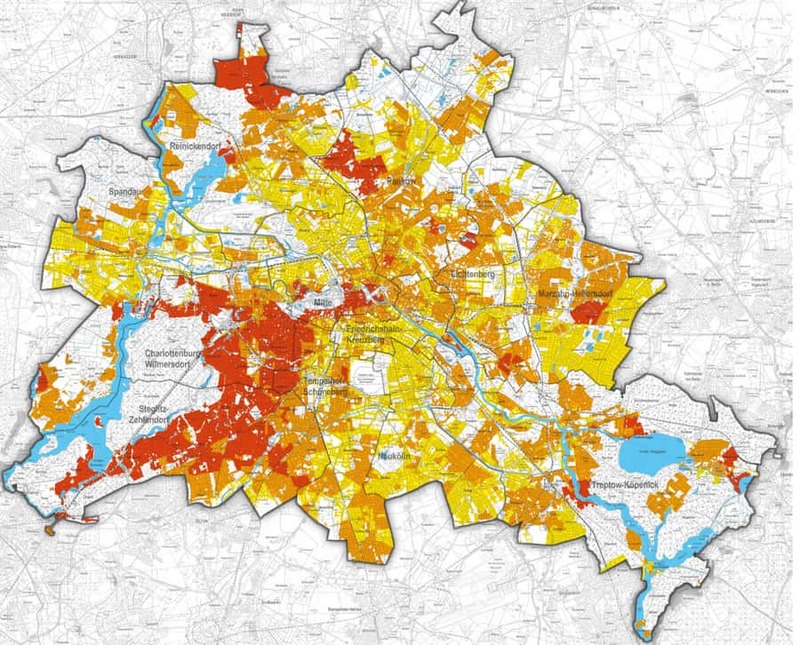 Furthermore, it classifies Berlin housing inventory in terms of desirability. The document is produced by the the Senate Administrations of the City of Berlin (the Senate Administration for Urban Development taking the lead). The Berlin Mietspiegel is a precious tools for anyone seeking to evaluate if there paying a fair market price for their rental. Though not an official document it is often used as reference in legal cases of abuse. Berlin is one of the most dynamic markets in Europe. In other words, rents significantly increased in the last 10 years. Many cases of abusive rent increases were reported and successfully tried. I.e. Berlin is a very tenant friendly city. It has explicit policies to slow down rent increases: the so-called Mietbremse. Here too, the Berlin Mietspiegel is a precious tool to calculate an investment’s expected return. Besides, a comparison of the previous edition can help identify or confirm developments and trends in the market. The rental income is perhaps the most important metric in terms of calculating one’s Cashflow, ROI, Cash on Cash Return and other income ratios. How to use the Mietspiegel? How do it work? Simply said, one can instantly get a specific property’s “usual rent” by following this search-link. In German Abfrageservice. Thanks to this tool, owners can check if there rental income is below market. In other words, this would give him ground for increasing the rent. More information on this topic in our article on Tipps on how to increase the rents in Berlin. The original document is a hefty german report which you can find here. Therefore, I have decided to create english copy of it. 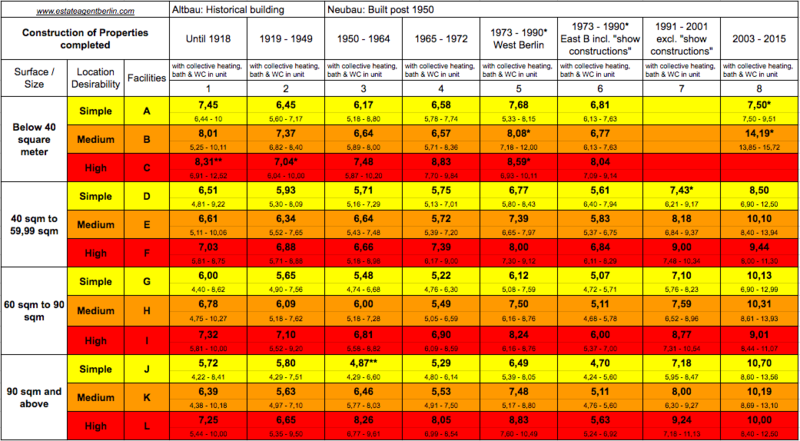 Altbau housing (completed before 1949) without collective heating, without bathroom, and with WC in unit cost an average of 0,87€ less than the usual price per square meter reported in line 1 and 2. Oldest Altbau housing (completed before 1918) without either collective heating or bathroom, and with WC in unit cost an average of 1,34€ less than the usual price per square meter reported in line 1***. Altbau housing (completed between 1919 and 1949) without either collective heating or bathroom, and with WC in unit cost an average of 0,35€ less than the usual price per square meter reported in line 2***. Residential building (completed between 1950 and 1964) without either collective heating or bathroom, and with WC in unit cost an average of 0,81€ less than the usual price per square meter reported in line 3***. a The classification of West Staakens is based on the area’s condition the 10/02/1990. The classifiaction of all other areas is based on the district reform of 12/31/2000. Empty cells represent areas where insufficient data was collected. Data with * or ** are also represent areas where insufficient data was collected and are therefore to be considered as vague indications (* = 15 – 29 data points ** = 10 – 14 data points). Data with *** also represent areas where insufficient data was collected and are therefore to be considered as very vague indications. According to the figures reported by the Senate Administrations of the City of Berlin, rents have risen an average or 8% in 2 years. The Administrations of the City of Berlin, was thorough enough to provide a detailed classification of the city of Berlin. Here you will find a detailed list of all major (an not so major) streets of Berlin. Furthermore, you will find here a map of Berlin reporting the different areas. The map exists in HD and Low definition. As for the table above, the colors on the map indicate the objective building quality. White: Not enough data collected. Noteworthy, the last edition of Berlin Mietspiegel (2017) offered an appendix with Rental operating costs based on quality of location (page 20). Unfortunately, these cost apply to 2015 and not 2017. For the sake of our dear anglophone readers we will report this in detail in the article operating costs in Berlin.